Home » Should You Go Back To School If You’re Still In Debt? This is one of those questions that can be tricky to answer , right? We are going to break it down in this post and attack the question from many angles. Should you go back to school if you dropped out of college and still owe on student loans? If you dropped out of college for one reason or the other and have made the decision to go back and you intend on borrowing money to do that, it is important that you would have kept up with the payments to be eligible for more money. In other words, if you have not kept up with paying your previous loans and you plan on going back to school, now is the time to get your loans back in good standing. Until your loans are back in good standing, unfortunately, your decision to return to school and pay for it with student loans will have to be delayed. Call your student loan lender and discuss with them that you would like to go back to school and thus would like to get your loan out of default. In most instances, getting your loan out of default will require you to make a payment of a certain amount and/or consistent payments over a certain period of time. For instance, paying a stipulated amount for the next 6 months could get you out of default. Once your loan payments are back in good standing, discuss with your lender what other arrangements you can make so that you can get the money you need to get back to your education. It is also possible for you to apply for a deferment if you are studying at least half-time at an accredited college. You can call up your lenders, show proof of the fact that you are attending school and fill out the necessary paperwork for a deferment. Your chances of getting a deferment increase if your previous loans are in good standing. 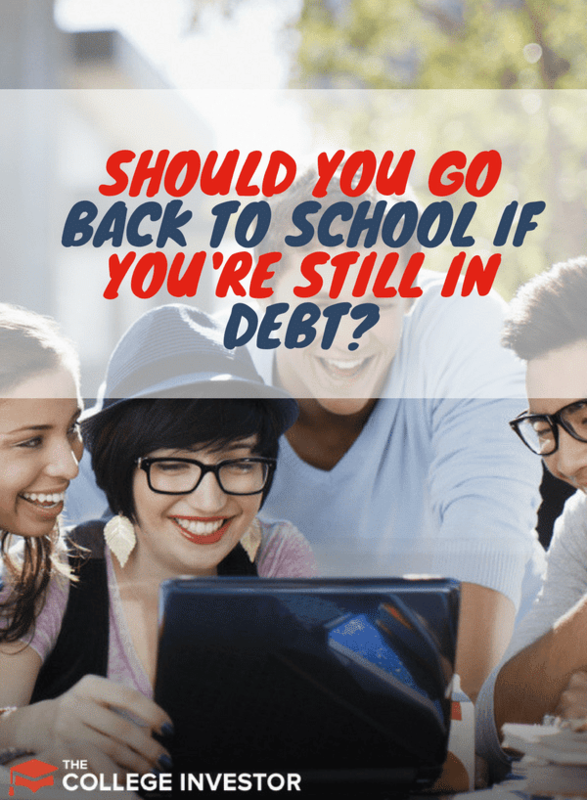 Should You Back To School If You Graduated But Are Still In Debt? This situation can be argued for and against on several levels. There are instances where going to back to school even though you are in debt is the right decision. If you are going into a professional vocation like medicine, pharmacy, dentistry, nursing, education or engineering, going back to school after you have incurred debt as an undergraduate can be a smart move. The skills in this profession are very specific and there tends to hardly be a shortage of high-paying positions. The ability to snag a job almost immediately after graduation and high-income earning potential of these professions - thus increasing the chances of paying off loans quicker would therefore be the argument for going back to school in this instance. If you are not in a professional vocation like the ones named above, it might be beneficial for you to further your education if a higher degree significantly increases the chances of you getting into a better position. The truth is that, sometimes a master’s degree or doctorate might be the barrier to entry for a particular field. If there is no getting around that and there is indeed an assurance of better income opportunities after you have graduated , then going back to school while you are still in debt is not a bad idea. If your education is completely paid for. This is a no-brainer. If your company has agreed to foot the bill for furthering your education, or you have won a grant or scholarship that covers all your educational expenses, there is no reason not to take up the opportunity even if you are in debt. Hardly will you read on this blog a suggestion to simply quit your education. This is a blog geared toward helping you excel in your financial life while getting an education after all. However, there does come a time when furthering your education while you are still in debt will put further stress on your financial situation. Where there is no guarantee that further education will get you a better job. It might be safer to seek “informal” modes of education like certifications that are offered through professional organization or even through online courses that tend to focus on increasing your employable skills. Online courses through Coursera and websites like DataCamp for instance can help you increase those skills dramatically. Where it makes no financial sense for you or your family at the time. If you are currently in a season where financial resources in your home are extremely limited, this also might be an indicator for not going back to school. There are instances where you may no longer qualify for federal loans because of the amount you have already taken out. Your only option then is to get a private loan - which tend to have high interest rates. Again, this could create stressful financial situations. Like I said at the beginning of this post, there is no simple answer to this question. At the end of the day, you will have to take stock of your overall life situation and determine if going back to school makes financial sense in the long-term. The points raised in this post are intended to be guideposts in helping you reach those decisions. Would you consider going back to school if you're still in debt? Your thoughts are welcome in the comments. Can you take on-line classes if your in loan default ? You can always take classes, you just won’t get any financial aid or student loans to pay for it. You’ll have to pay for it 100% out of your own pocket. My loans were in default, but the government took my tax return and now my loans are completely paid off. Am I eligible to get another loan? First, are you sure your loans are completely paid off? It’s rare for that to happen via a tax refund offset. Usually, the offset covers collection costs and accrued interest. Honestly, you’d be the first person we’ve ever seen that had their loans paid off this way. Second, if that’s really the case, you likely aren’t eligible for more financial aid since the loan was paid via the collection agency. If you loan is still out there, you have the ability to regain access to Federal aid by getting your loan out of default.